"Where Were You?" is an ongoing project that involves in the intersection of high-profile death, and daily life. 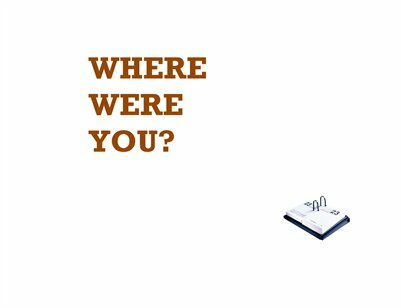 Since 1992, I have made notes on "where I was" when I heard that someone well-known or famous or high-profile had passed away. I also noted whatever this person made me think about. Since 2006, I have gathered these entries in annual collections, starting with physical zines, and then transitioning to what I think of as digital zines. For various reasons the 2011 version was delayed for so long that I ended up deciding to produce this double edition for 2011 and 2012. The project has come to function as a semi-linear accidental virtual memoir, guided by the obituary page: A life in death. #protip: Just grab the free digital version. The print iteration, even at the lowest price MagCloud allows, really isn't worth it.